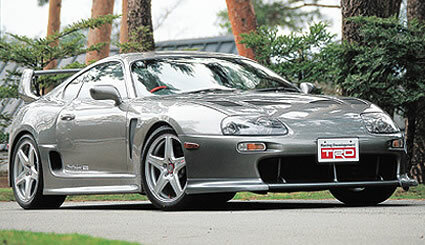 TRD 3000GT Supra was a one off also, with pretty much nothing but the widebody kit and the upgraded bilstein shocks. Toyota doesn't usually upgrade powerplants mid cycle. Supra got VVTi from 97 onwards but that was about it. JZA70 Supra got an upgrade from 3 litre Single Turbo 7MGTE to the 2.5 litre twin turbo 1JZGTE. I think if they were going to introduce a turbo they'd have done it already. Everything that isn't a white FRS with 35% tints, Gramlight 57 Extremes, and KWV3s is considered rice on this forum. Looks good. Toyota is obviously just messing around with the 86 at this point. The Antiriced drives a Hot Lava FR-S so what exactly are you saying? On the car, not rice. Not bad but still I think the stock body style is hard to improve on. First thing people want to do to it is angleize it. The flowing lines are what make it so attractive in the first place. Don't forget to add that setup or any white 86 is "clean". 2013 Fuji Red Toyota 86 GTS 6spd. It was a one off 1996 model that came stock with the TRD 3000GT Widebody kit. Most of these are just incremental improvements that should simply be rolled into production models. Like this, just welding an extra piece of metal into control arms for rigidity. That adds maybe .20 cents into each. Unless this car laps a racetrack significant faster than a stock one its a poser. Would it kill them to even touch the damn engine? Tune? Better exhaust?? Ffs even Bunta knew it was time to add power to his 86? I love it. If I had money, I'd buy it in a heart beat. Would it kill them to even touch the damn engine? They supposedly reshaped the valves. $60k and warranty voided if you hit the track or even push the car too hard on the road... Yup, it's for posers/collectors.